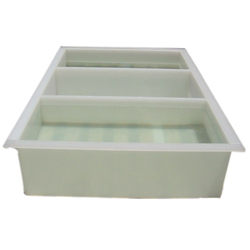 We are a leading Manufacturer of polypropylene tank and chrome tank from New Delhi, India. We bring forth an optimum quality range of PP (Poly Propylene) Tanks, which can be availed by clients at industry leading prices. These tanks have a robust construction, and cater to the requirements of various industries. With the aid of our proficient engineers and technicians, we manufacture these PP tanks in varied specifications and models. Furthermore, our R&D unit enables us to continuously provide our clients with upgraded PP (Poly Propylene) Tanks. We are an ISO certified manufacturer and supplier of a defect-free range of Chrome Tanks, which can be availed by clients at market leading prices. Demanded in numerous industries, the chrome tanks offered by us are reckoned for their long functional life. Easy installation and corrosion resistant finish are some of the features making these tanks the preferred choice of clients located across the nation.